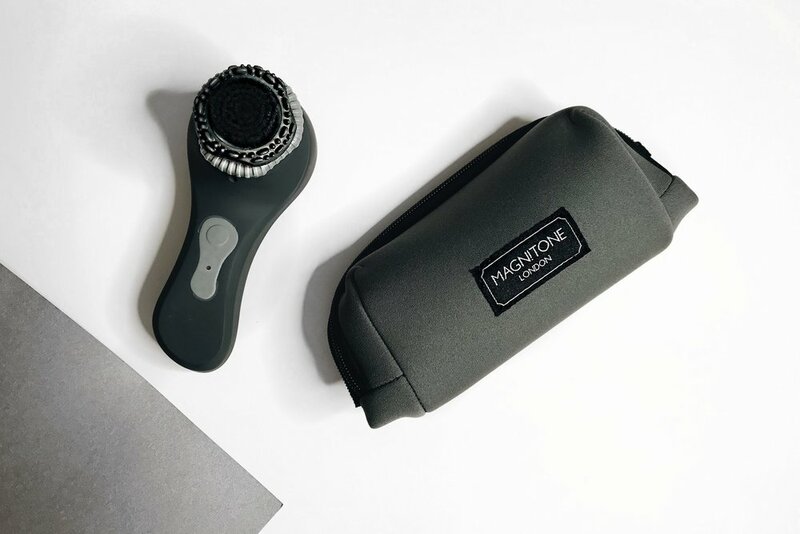 Magnitone had very kindly sent out their latest 'Clean Sweep' Skin Brush For Men for me to trial, and I have to say, I have found it to be a neat little gadget! The Skin Brush comes with many features such as a Power Light, Turbo Mode Light, a charge spot which is magnetic allowing for easy use, and my favourite feature? The HydroPRO Brush Head: The precision moulded silicon on the Skin Brush has been specifically engineered for men's skin which exfoliates 30% deeper and gets under all of your facial hair whilst helping to prevent ingrown hairs! For me personally, I found it was better to use the Clean Sweep at night just before going to bed to allow the cleanser to work overnight. I placed the brush head into the circle and turned it until it locked into place. I then applied a cleansing gel (Kiehl's Age Defender Dual-Action Exfoliating Cleanser) upon my skin and dampened the brush and began to massage the skin in a circular motion. After cleansing my skin until I felt comfortable with, I then pressed the button again which then goes into 'Turbo Mode' which detangled and really got underneath my facial hair to allow for a deeper cleansing feel! I washed off the cleansing gel and left my brush head to dry overnight. The Clean Sweep felt soft upon my skin which was a pleasant surprise as prior to using this, I was slightly dubious as to whether or not the silicon may be a little too hard on the skin. I found that the silicon actually helped to guide the brush better and easier across my face! After using the Clean Sweep, my face felt a lot smoother, looked more radiant and overall I was impressed with how effective the brush was! You can purchase the Magnitone Clean Sweep Skin Brush For Men here. Have you tried the Clean Sweep before? How did you find it? Are you a fan of Cleansing Brushes? Do let me know your thoughts below as I would love to hear from you, and don't forget to click that 'like' button!